This handmade pair of 18 karat white gold earrings weighs app. 2grm. The earrings are set with glittering emeralds. They are asymmetrical. Butterfly fastening for pierced ears. This handmade pair of 18 karat white gold earrings weighs app. 2grm. The earrings are set with emeralds and rubies. They are asymmetrical. Butterfly fastening for pierced ears. This handcrafted pair of 18 karat white gold earrings weighs app. 4grm. The flowers are set with emeralds and the fan-shaped part are set with white diamonds, yellow diamonds and pink sapphires. Butterfly fastening for pierced ears. They can be worn as a two-part design, or as studs. This one-of-a-kind earring is expertly crafted by hand from 18 karat white gold app. 7grm. It is for a pierced ear, to be worn on the left side. It is set with lush green emeralds. Sold individually. Pair yours with another single stud from the collection. Award-winning creation. This earring is handmade from 18 karat white gold app. 1grm, set with emeralds. Butterfly fastening for pierced ears. This handmade pair of 18 karat white gold earrings weighs app. 2grm. The earrings are set with emeralds. They are asymmetrical. Butterfly fastening for pierced ears. This handmade pair of 18 karat white gold earrings weighs app. 2grm. 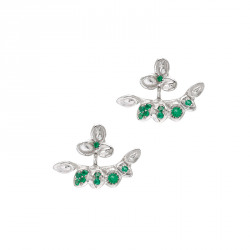 The earrings are set with emeralds. Butterfly fastening for pierced ears. This handmade pair of 18 karat white gold earrings weighs app. 2grm. The earrings are set with emeralds, rubies and blue sapphires. They are asymmetrical. Butterfly fastening for pierced ears. This chain is 18 karats white gold app. 3grm. Set with emeralds. Wear it layered with other pieces. Clasp fastening. This earring is handmade from 18 karat white gold app. 3grm. It is for a pierced ear, to be worn on the right side. 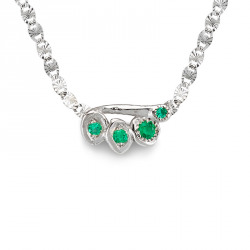 it is set with emeralds, sold individually. Pair yours with another single stud from the collection. This one-of-a-kind necklace is expertly crafted by hand from 18 karat white gold app. 27grm, set with glittering emeralds total app. 1,71ct. It is entirely articulated for great comfort. It has a hand made T-bar fastening. Award-winning creation. This handmade pair of 18 karat white gold earrings app. 2grm, are set with emeralds. Butterfly fastening for pierced ears.